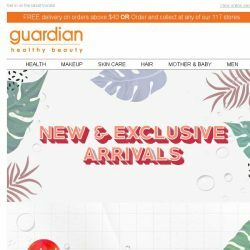 [Guardian] ✨ Be the FIRST to try our new arrivals! 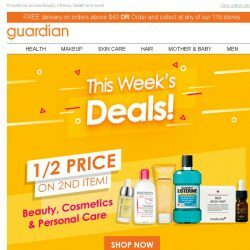 [Guardian]  PROMO CODE ALERT! 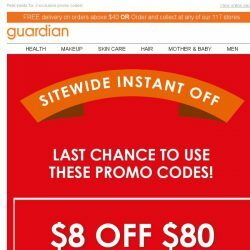 Up to $36 off inside! 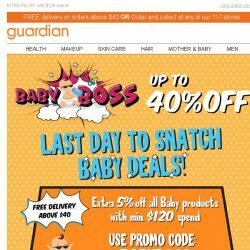 [Guardian]  Hurry, last chance for up to 40% OFF on Baby Boss deals! 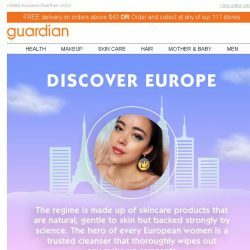 [Guardian]  This week: We bring you the BEST Beauty brands from Europe! 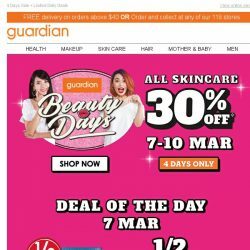 [Guardian]  No April’s Fool Joke! 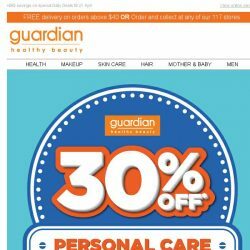 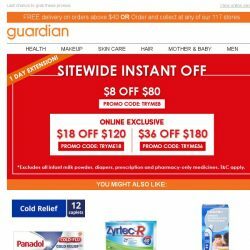 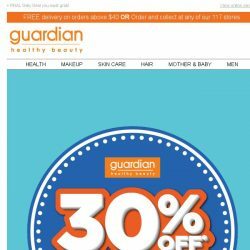 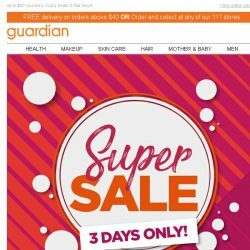 1-DAY Extension for Guardian Super Sale! 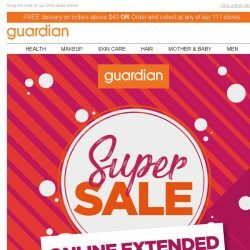 [Guardian]  GUARDIAN SUPER SALE ending in just HOURS! 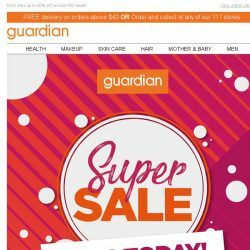 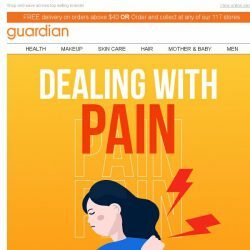 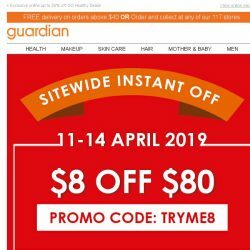 [Guardian] ✨ GUARDIAN SUPER SALE | Up to 60% OFF! 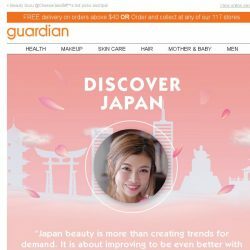 [Guardian]  Beauty Holiday: Korea’s BEST Beauty Deals! 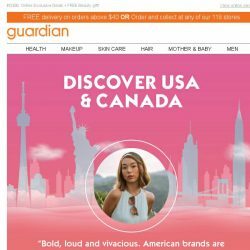 [Guardian]  JUST IN: TOP Beauty offers from USA + Canada! 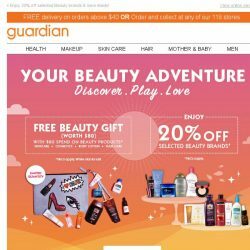 [Guardian]  Spend and receive a FREE Beauty Gift worth $80! 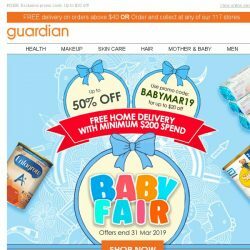 [Guardian]  Less than 48 hours left to enjoy up to 50% off Baby Essentials! 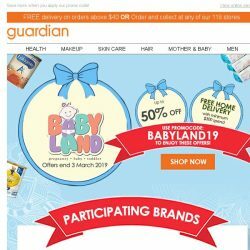 [Guardian]  Parents, save up to 50% OFF with exclusive Babyland offers! 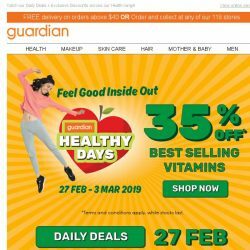 [Guardian]  Healthy Days is here with 35% off our Vitamins Bestsellers! 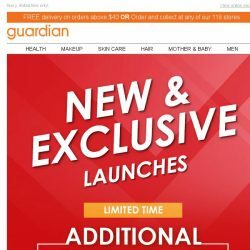 [Guardian]  ADDITIONAL $8 OFF these new launches! 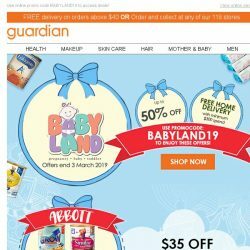 [Guardian] ✨ This Week’s BIGGEST Deals, right here! 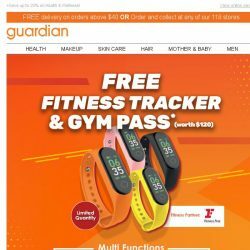 [Guardian] ‍♀‍♂ FREE Fitness Tracker & Gym Pass worth $120 up for grabs! 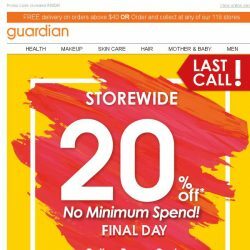 [Guardian] ⌛ 24 Hours Left: 20% OFF Storewide!